« Beyn Hayamim Band – Debut Album – 2018. At the festival will be screening more than 500 different length of films. The audience may watch full-length animated movies, participate at the courses, attend workshops, have a peak at the exhibitions and enjoy concerts. Beside screenings Q&A type intimate, interactive meetings with creators by the audience. During the day professional trainings and masterclasses, workshop organized for art school pupil from Hungary and international students. The spotlight turns on to the young animation directors as well. 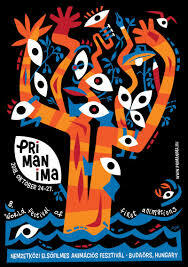 The Primanima was founded in 2012. The main priority was to create an opportunity to present the works of Hungarian and international young talents who are at the beginning of their career. Within the festival, the student films, graduation films, first films are in competition for awards given by the professional international jury and vote by the audience. Among the submissions can see animations from the leading animation schools of the world such as the Royal College of Art, the National Film and Television School – Longos – the Gobelins, La Poudriere – France, the Baden-Württemberg Filmakademie – Germany, the CalArts – U.S.A, the Moholy-Nagy University of Art and Design Budapest and the Budapest Metropolitan University. No entry fee for Primanima FunZone, special screenings for children and masterclasses.